Connect two Schedule 40 PVC pipes at a 90° angle with these elbows. 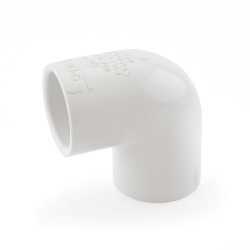 We carry every type of PVC fitting for your plumbing system. The 406-005 from Spears is a 1/2” PVC (Sch. 40) 90° Elbow. It connects two 1/2" PVC pipes together a.. The 406-007 from Spears is a 3/4” PVC (Sch. 40) 90° Elbow. It connects two 3/4” PVC pipes together a.. The 406-010 from Spears is a 1” PVC (Sch. 40) 90° Elbow. It connects two 1” PVC pipes together at a .. The 406-012 from Spears is a 1-1/4” PVC (Sch. 40) 90° Elbow. It connects two 1-1/4” PVC pipes togeth.. The 406-015 from Spears is a 1-1/2” PVC (Sch. 40) 90° Elbow. It connects two 1-1/2” PVC pipes togeth.. The 406-020 from Spears is a 2” PVC (Sch. 40) 90° Elbow. It connects two 2” PVC pipes together at a ..